Note: These plans consist of a booklet of 7 pages of text and photos on 8.5" x 11" pages plus an 18" x 24" drawing. The printed version is black and white. The PDF file for instant download has color photographs. To save $10 and postage costs choose the download option below. This simple tub can be built with a minimum of woodworking tools, and building materials are available from your local lumberyard. The tub can be built to any practical size and height, from a small single person configeration which uses a minimum amount of water and heats quickly, to a large family size tub. 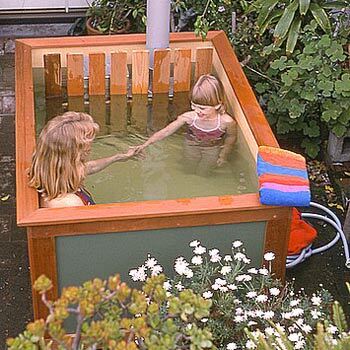 The tub is portable depending on size, it can be used indoors or out, and conventional heat and jetting systems can be installed as with any tub. 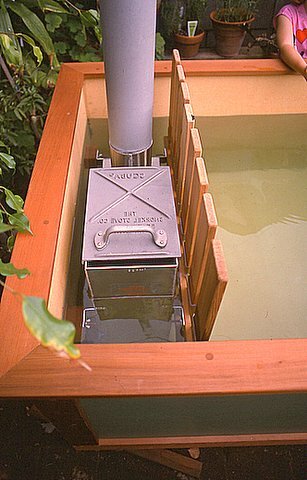 For those with simpler needs or remote locations with no access to power, wood burning hot tub stoves are available from Snorkel and Chofu. Sheet foam insulation may also be fitted and applied to the bottom and sides of the tub for energy efficiency. A removable sheet foam cover will keep water hot longer. Simplicity of construction is a big advantage of this design and the rectangular shape eliminates the need to cut difficult joints. None of the tolerances are critical and all cutting may be accomplished using a portable circular saw and a small handsaw. 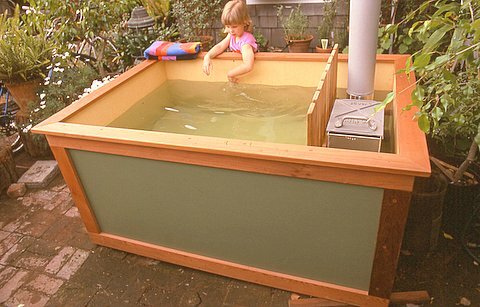 This tub is constructed from High Density Overlay (HDO) plywood. The hard overlay provides a relatively maintenance free waterproof surface on both sides, and the exterior can also be painted for special decorative effect. Fllexible sealant can be applied as needed to joints and corners and under the perimeter cap moulding. Exterior and marine grades of ply may be used, especially if coated and sealed with epoxy and/or fiberglass cloth. Quality hardwood ply can be used without fiberglass sheathing and finished natural. Plans include a blueprint and step-by-step instructions.